NEW YORK, 27 November (Office for Disarmament Affairs) — The twenty‑seventh United Nations‑Japan Conference on Disarmament Issues will take place in the International Conference Centre in Hiroshima from 29 to 30 November. 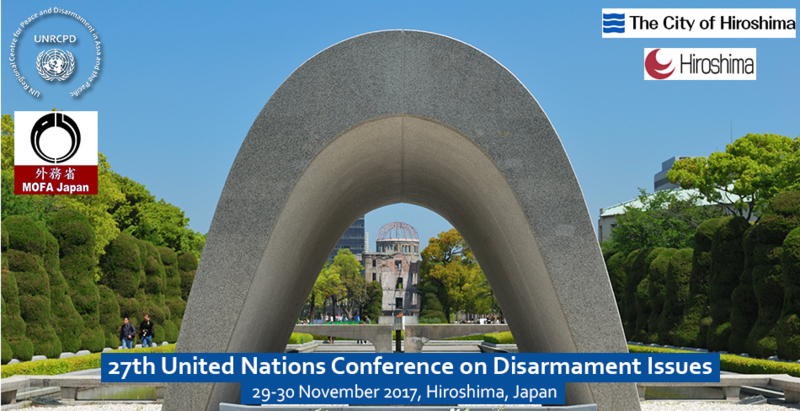 The annual event is organized by the Office for Disarmament Affairs, through its Regional Centre for Peace and Disarmament in Asia and the Pacific, in cooperation with the Government of Japan and in partnership with the 2017 hosts, the Prefecture of Hiroshima and the City of Hiroshima. More than 50 representatives from Governments and intergovernmental organizations, as well as research institutes, academia and non‑governmental organizations will gather at the Conference. Izumi Nakamitsu, Under‑Secretary‑General and High Representative for Disarmament Affairs, and Tomoyuki Yoshida, Director‑General for Disarmament, Non‑Proliferation and Science Department in Japan’s Ministry of Foreign Affairs will open the event. Hideki Yuzaki, Governor of Hiroshima Prefecture, and Kazumi Matsui, Mayor of Hiroshima City, will welcome participants. The City of Hiroshima continues the tradition established in 1989 of different cities hosting the United Nations‑Japan Conference on Disarmament Issues. The event provides a forum for frank and interactive dialogue on pressing security, disarmament and non‑proliferation issues. The 2017 Conference will reflect on the prospects for nuclear disarmament, taking into account recent and current developments and their impact in the lead‑up to the 2020 Review Conference of the Treaty on the Non‑Proliferation of Nuclear Weapons, including regional non‑proliferation challenges. Furthermore, the Conference will address the importance of education on nuclear disarmament and non‑proliferation. The Conference is financed by the Government of Japan, through its voluntary contribution to the Office for Disarmament Affairs, the Prefecture of Hiroshima and the City of Hiroshima. On the eve of the Conference, the United Nations Regional Centre for Peace and Disarmament in Asia and the Pacific and the United Nations Institute for Training and Research, Hiroshima, will hold a screening of the documentary film Paper Lanterns as a side event in the Memorial Hall of the Hiroshima Peace Memorial Museum on 28 November.